"Shortly after construction of our new bank facility, we experienced humidity problems exceeding 80% in our crawl space. That is when Colorado Basement Systems came to our rescue with the installation of a CleanSpace Crawl Space Encapsulation System..."
Cleanspace has developed the most effective and long-term solution for crawl spaces. We are certified, trained and experienced in the complicated issues of mold problems. Colorado Crawl Space has been serving Northwest CO., including Aspen, Vail & Craig since 1978! Colorado Crawl Space is your locally owned and operated business that is licensed, insured and certified to do business in North West Colorado. For years we have been satisfying customers by providing cost-effective, permanent solutions for their water problems turning their crawl space into dry, usable space. We maintain an A+ ranking in the Better Business Bureau. Our crawl space encapsulation services are available to residents in Vail, Steamboat Springs, Aspen, Carbondale, Rifle, Glenwood Springs, Breckenridge, Rangely, Buena Vista, & Hot Sulphur Springs areas and nearby. Crawl spaces are at risk of serious mold and rot damage because of moisture buildup. By encapsulating your crawl space and sealing it with vapor barrier you prevent the free air and moisture flow from the soil to your home's foundation. 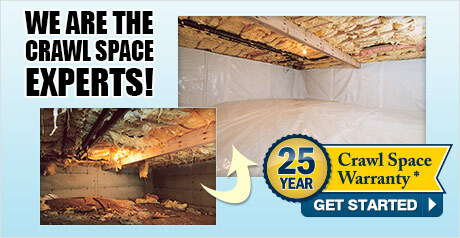 We warranty our crawl space encapsulation system for 25 years. Ready to Start your Crawl Space Project? Our crawl space encapsulation services are available to residents in Vail, Steamboat Springs, Aspen, Carbondale, Rifle, Glenwood Springs, Breckenridge, Rangely, Buena Vista, & Hot Sulphur Springs areas nearby.